A paste of 100% pure roasted hazelnuts, all natural. 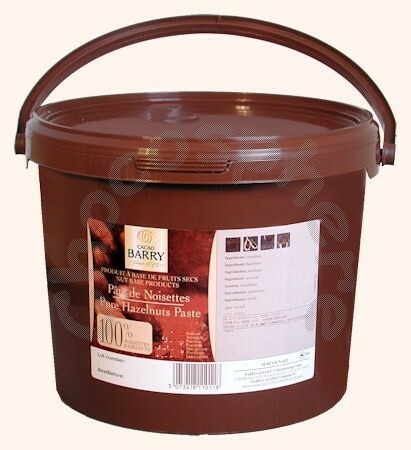 Cacao Barry Pure Hazelnut Paste is simply 100% finely ground freshly roasted hazelnuts with nothing added or taken away. It is all natural with no preservatives, no emulsifier, and no added sugar. This hazelnut paste can be used in a variety of creations such as mousse, ganache, ice cream, chocolate-hazelnut spread, and so much more. Because of the purity of this 100% hazelnut paste, you will find separation of the ground nuts from their naturally occurring oil when you open the bucket. Just stir everything together to re-combine. Though not required, cool storage is helpful in keeping the paste fresh and reducing separation of oil from the ground nuts. Packaged in a 5 Kg / 11 lb net weight recloseable pail.